Due to this it's easy to accurately chart the Moon's phases, the zodiac path appearing in our main chart is dependant upon the relative planetary positions, again allowing for accurate charting. Traditionaly the Moon is considered to have eight phases, as well as the four discussed there are two crescent and two gibbous phases which are in effect sub divisions of the path. Waxing means growing, and Waning means shrinking. A Moon cycle lasts for approximately 29½ days. The phases of the Moon are the same no matter what your location on Earth, as they are determined by the relative positions of the Earth, Sun, and Moon. The Moon rises at approximately sunset when it's a Full Moon, and approximately sunrise when it's a New Moon. 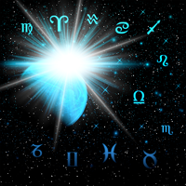 When referring to the Moons age a New Moon is the starting point. Due to the Moons cycle being 29½ days, you occasionally get two Full Moons in one month, this happens on average every 2.7 years. When this happens the second Moon of the month is called a 'Blue Moon'. When two New Moons occur in a month the second is called a 'Dark Moon'. The Moon may appear to be 'Full' for a few days, however this is only due to the illumination and the distance we view it from. The Moon is only Full at a given date and time, but as it may be approximately 95% illuminated two days before or after a Full Moon, the human eye perceives it as still being a Full Moon. The Blue Moon A Blue Moon occurs when the moon with its 28 day cycle appears twice within the same calendar month. The Black Moon A Black Moon occurs when there are two dark cycles of the moon in any calendar month. February The Chaste Moon - renewal, youth, mending a broken heart, new love as the signs of winter begin to fade. March The Seed Moon - rebirth, to rejuvenate passion, to plant the seeds of new love. April The Hare Moon - fertility, growth; a time to honor the Goddess Ostara, patron of springtime. May The Dyad Moon - a time to bond, find a partner, share. June The Mead Moon - a time to pick fresh flowers, hay, grass for love talismans. July The Wort Moon - a time to gather herbs (worts) to dry for love spells later on. August The Barley Moon - a time to manifest love, cast spells for what you want, harvest the first fruits. October The Blood Moon - a time to recall the blessings of former loves and prepare for winter loving; a time to renew one's commitment to a lover. November The Snow Moon - a time to honor the Snow Queen, the Frost Giants, and the cold cycle of the earth; a time to provide warmth and coziness. December The Oak Moon - a time to strengthen a relationship, to build Yule fires. Native American: (there are many variations on this and different tribes used different names). Celtic: (again other variations on the theme).